Alexander Jaggy is the Co-Founder and CCO of thjnk Zurich. He has been in the advertising industry for almost 20 years. After completing his diploma in business administration, in 1990 he immediately joined BBDO Zurich as a copywriter, before moving to the legendary GGK. In 1994 his career path led him to Germany, first to Springer & Jacoby, then to Jung von Matt. In 1999 he was hired by Springer & Jacoby to help set up the agency's international office in London. After seven years abroad he returned to Zurich in 2001 to join the newly founded Jung von Matt/Limmat. In 2004 he was appointed Executive Creative Director, and in 2006 he became joint partner in the agency. Alexander Jaggy has been honoured with a number of sought-after international awards. 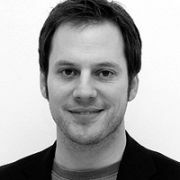 In 2006 he received a Gold Lion for client MINI, and on the same day Jung von Matt/Limmat was awarded second place in the competition for "Media Agency of the Year" in recognition of its innovative advertising – a first for a Swiss agency. In 2008 Jung von Matt/Limmat achieved its best result ever from the Art Directors Club Switzerland since the agency was founded and was named "Agency of the Year". After winning the prestigious Migros account at the beginning of 2009, within just 100 days the agency topped of its run of success by bringing home a Cannes Lion. Alexander Jaggy has a Bachelor's and a Master's in Creative Leadership. He is a Member of the Board of ADC Switzerland, as well as a member of ADC Germany and D&AD in the UK. Alexander Jaggy is married with three children. He lives in Zurich.